Butte County Sheriff Korey Honea said Friday that some people were found inside their cars and others were found outside vehicles. PARADISE, Calif. — The air thick with smoke from a ferocious wildfire that was still burning homes Saturday, residents who stayed behind to try to save their property or who managed to get back to their neighborhoods in this Northern California town found cars incinerated and homes reduced to rubble. People surveyed the damage and struggled to cope with what they had lost. Entire neighborhoods were leveled and the business district was destroyed by a blaze that threatened to explode again with the same fury that largely incinerated the foothill town. Butte County Sheriff Kory Honea said Saturday 14 additional bodies were found, bringing the death toll to 23. The victims have not been identified. Two people were found dead in a wildfire in Southern California, bringing the total number of fatalities for the state to 25. An additional search and recovery team on top of the four already on the ground was being brought in to search for remains, Honea said. An anthropology team from California State University, Chico was helping with that effort, he said. The sheriff's office still has 110 outstanding reports of missing people, Honea said. Alexander Tobolsky, right, and his girl friend Dina Arias, return to his home where burned out by the fire in Malibu, Calif., Friday, Nov. 10, 2018. "This weighs heavy on all of us," he said. "Myself and especially those staff members who are out there doing what is important work but certainly difficult work." Honea added that he's hopeful that more of those missing people will be found. The department initially had more than 500 calls about citizens who were unable to reach loved ones. But they have been able to help locate many, he said. The flames burned down more than 6,700 buildings, almost all of them homes, making it California's most destructive wildfire since record-keeping began. There were 35 people still missing. More firefighters headed to the area Saturday, with wind gusts of up to 50 miles per hour expected, raising the risk of conditions similar to those when the fire started Thursday, said Alex Hoon with the National Weather Service. The blaze grew to 164 square miles (425 square kilometers), but crews made gains and it was partially contained, officials said. It has cost $8.1 million to fight so far, said Steve Kaufmann, a spokesman for the California Department of Forestry and Fire Protection. People sidestepped metal that melted off cars and Jet-Skis and donned masks as they surveyed ravaged neighborhoods despite an evacuation order for all of Paradise, a town of 27,000 founded in the 1800s. Some cried when they saw nothing was left. Jan MacGregor, 81, got back to his small two-bedroom home in Paradise with the help of his firefighter grandson. He found his home leveled — a large metal safe and some pipe work from his septic system the only recognizable traces. The safe was punctured with bullet holes from guns inside that went off in the scorching heat. He has lived in Paradise for nearly 80 years, moving there in 1939 when he said the town had just 3,000 people and was nicknamed Poverty Ridge. The fire was not a complete surprise, he said. "We knew Paradise was a prime target for forest fire over the years," he said. "We've had 'em come right up to the city limits — oh yeah — but nothing like this," he said. MacGregor said he probably would not rebuild: "I have nothing here to go back to." Homes and other buildings in Paradise were still burning, and fire crews were trying to extinguish those blazes, said Scott McLean, a captain with the California Department of Forestry and Fire Protection. Officials warned firefighters to wear their helmets and be careful of falling trees. Abandoned, charred vehicles cluttered the main thoroughfare, evidence of the panicked evacuation as the wildfire tore through Thursday. The dead were found mostly inside their cars or and outside vehicles and homes. Five of the dead panicked when they couldn't escape by car because their route was cut off by a wall of fire, said Gabriel Fallon, who rode out the blaze with his parents to care for the horses, cows and livestock on their 10-acre farm in Paradise. The group turned the other way and dashed down the paved street until it turned into dirt and passed the Fallons' farm, he said. One of the drivers stopped and asked Fallon if the direction they were going would lead them to safety. Fallon said he shook his head as the fire roared closer. 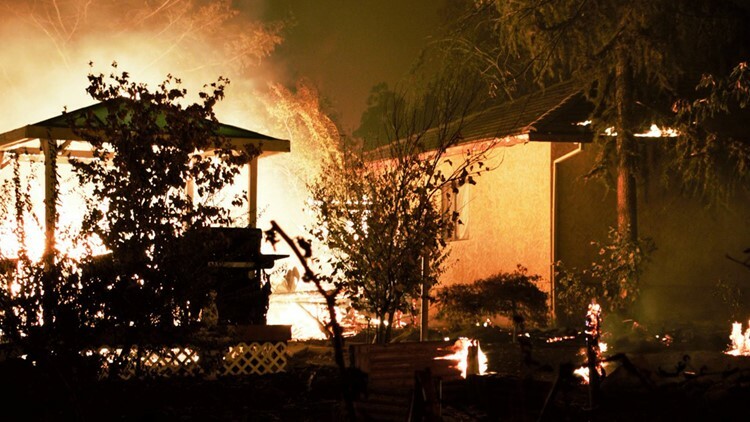 The Camp Fire destroys homes in Paradise, Ca. on Thursday, November 8. The motorists parked at the end of the road. On Saturday, the charred shells of the five cars remained where they had been parked. Fallon went back to his property, where he, and his parents and their animals weathered the fire with a garden hose. The fire consumed their home, but left the barn intact. "I was scared as hell," said Fallon, 42. "I didn't know if I was going to die." His mother, Cathy Fallon, said she tries not to think of what she lost when her house burned to the ground. Two of her dogs and nine cats died. She also lost her great-grandmother's mandolin and end table. "I just can't think about it," she said, beginning to cry. "The thing that hurts the most is that I lost my cats." Elinor "Jeannie" Williams, 86, was not among the nine victims of the blaze but died as she waited to be airlifted from an evacuated hospital where she was being treated for a head injury. She was dying, and the family expected to lose her in a few days, said her stepdaughter, Lisa. Still, her death has been hard on her 84-year-old father, Robert, who also may have lost his home, she said. "He's lost, he's confused, he's trying to hang in there," she said. "It's hitting him hard. Everything is gone, including his wife." 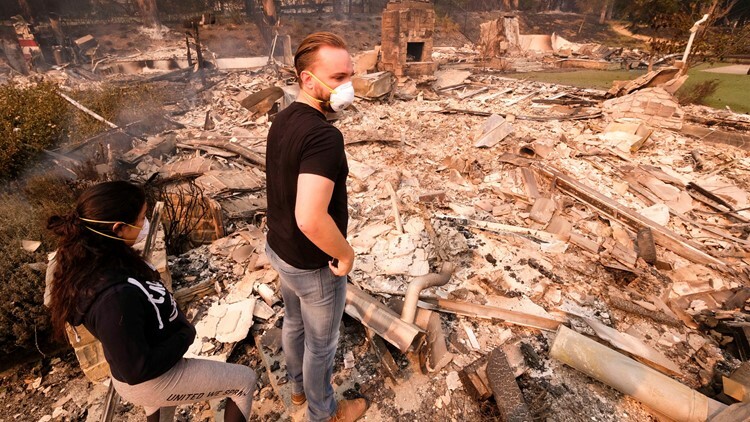 Two destructive wildfires also burned in Southern California , tearing through Malibu mansions and working-class suburban homes and killing two people. State officials put the total number of people forced from their homes by California's fires at more than 200,000. Evacuation orders included the entire city of Malibu that is home to some of Hollywood's biggest stars . President Donald Trump issued an emergency declaration providing federal funding for fires on both ends of the state. He later threatened to withhold payments to California, claiming its forest management is "so poor." Trump tweeted Saturday that "there is no reason for these massive, deadly and costly fires in California." Trump said "billions of dollars are given each year, with so many lives lost, all because of gross mismanagement of the forests. Remedy now, or no more Fed payments!" California Governor-elect Gavin Newsom responded on Twitter that this was "not a time for partisanship." "This is a time for coordinating relief and response and lifting those in need up," he said. Trump took a more empathetic tone later in the day, tweeting sympathies for firefighters, people who have fled their homes and the families of those killed by the flames. California emerged from a five-year drought last year but has had a very dry 2018. Much of the northern two-thirds of the state, including where the fire is burning, is abnormally dry, according to a U.S. government analysis. Just 100 miles (160 kilometers) north, the Carr Fire near Redding that burned this summer was the sixth-most-destructive wildfire in California history and one of the earliest. It killed eight people in July and August and burned about 1,100 homes. "The fact is that we are saturated with these kind of fires," safety officer Jack Piccinini told firefighters in Chico. He warned of "emotional fatigue" among crews from the devastation, death and injuries. "We need to make sure we take care of one another, we look out for our brothers and sisters out there," he said. Associated Press writers Daisy Nguyen, Olga R. Rodriguez and Sudhin Thanawala in San Francisco contributed to this report. Darlene Superville contributed from Paris.